Martha Berry thanks the recipients for their Christmas gifts to the school and hopes that they had a beautiful Christmas. 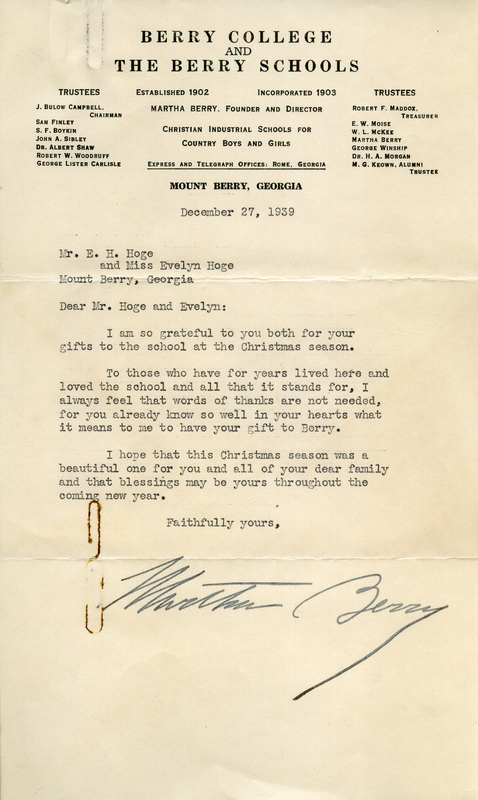 Martha Berry, “Letter to Mr. E. H. Hoge and Miss Evelyn Hoge from Martha Berry.” Martha Berry Digital Archive. Eds. Schlitz, Stephanie A., Cassie LaJeunesse, Jessica Hornbuckle, et al. Mount Berry: Berry College, 2016. accessed April 19, 2019, https://mbda.berry.edu/items/show/15325.